Pull the spring loaded “holder” away from the body of the sharpener. Pinch the levers at the top of the “holder” together (they’re also spring-loaded) to open. Insert the pencil through the holder and into the sharpener (while keeping the holder away from the sharpener. *the holder keeps pressure on the pencil towards the sharpener. 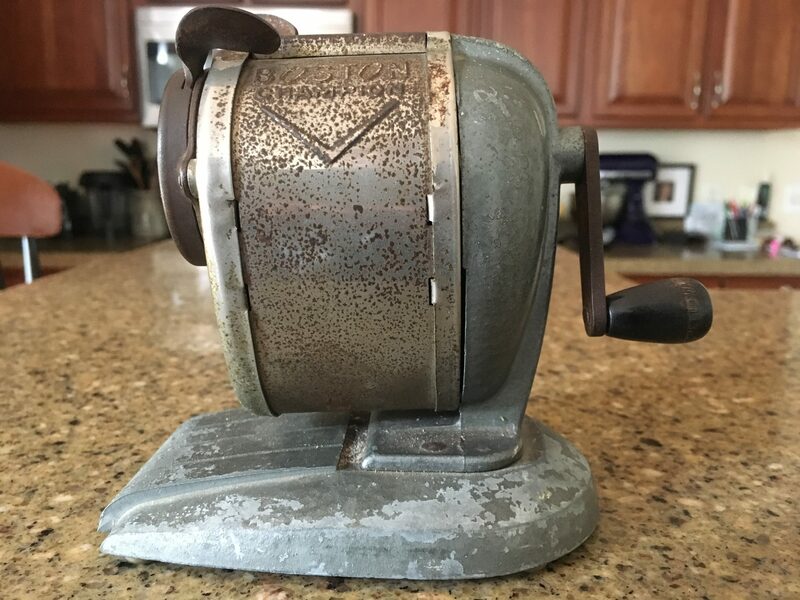 Use one hand to steady the sharpener while the other spins the crank arm to sharpen said pencil. Squeeze the levers on top of the holder to widen. Admire the most beautifully sharpened pencil of your life! 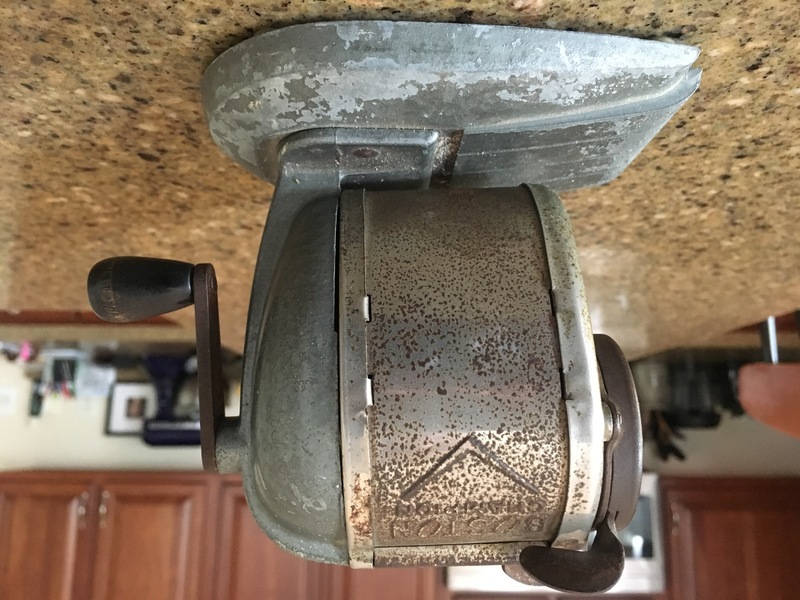 This pencil sharpener has been in my family literally for generations. And as much as it annoys my wife, I love it and believe it’s the best version out there. It IS sturdy. Designed to do the best sharpening ever. It’s never gonna wear out or break. Ever. It does best, what I value most out of it. Alright. You’ve been patient enough. Do you see where I’m going? The designers of this had some decisions to make. Some of them very difficult. There’s not one way to design a pencil sharpener. There are things they needed to say “no” to. They had to pick a focus and run with it. They chose the pencil-sharpening focus above almost all else. It’s not the most portable, or lightest or cheapest, like those little plastic things in my son’s school supplies. It’s not electric (and therefore prone to breaking or worthlessness during a blackout). And it’s not a funny cartoon shape designed to entice a three-year-old to want to collect a hundred of them. You have to focus and make some hard decisions. Mostly these are about what your values and what you will prioritize and what you will say “no” to. If you try to be all things to all people you will end up being nothing special to most of them. I love this pencil sharpener … because it does the best sharpening I’ve ever seen. And I work from home and its heavy bulk stays right on my desk shelf. To my wife, it is obnoxiously difficult to operate. To differentiate yourself in the market, you must focus, make difficult strategic choices, and then stand behind them. It can work for you. So … here you go … the best-worst pencil sharpener in action. See the video below. 1) I greatly admire that pencil sharpener. 2) If you could affix it to the surface on which it sits, it would be much easier to use. 3) I apologize that my comment does not speak to the point of your post. Thanks David for the admiration of said sharpener of pencils. Affixing it to a surface was clearly a choice which they said “no” do in the design. Probably to maintain a minimal amount of portability. No … you did not seem to, er, get the, um, point … of the post. However (comma) you did maintain a, well, sharp focus.